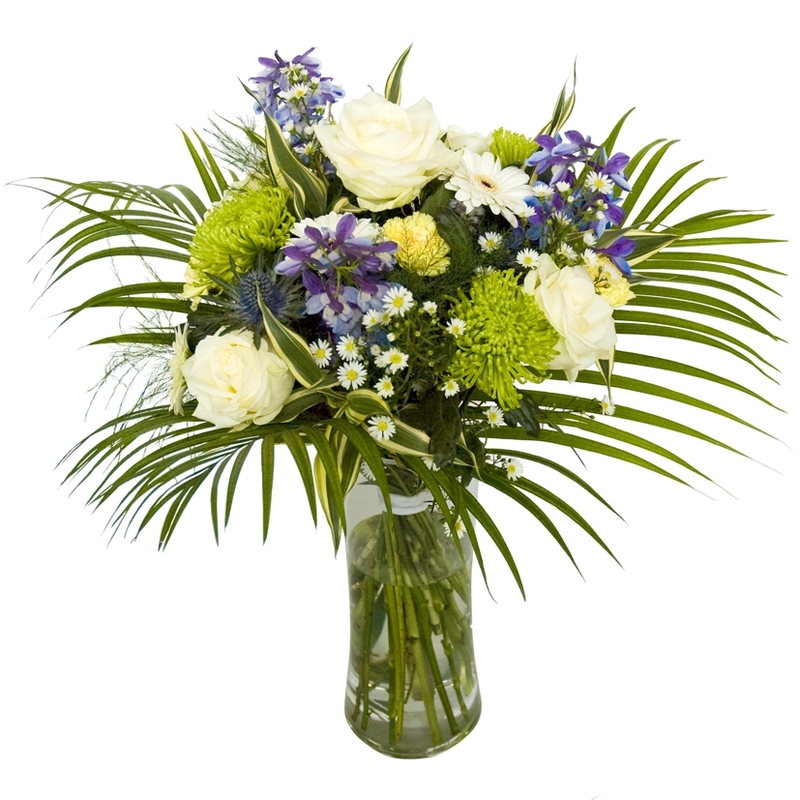 A bouquet containing a mix of flowers and foliage secured with ribbon, ready to pop into your favourite vase. What is an Aqua Packed Hand Tied Bouquet? 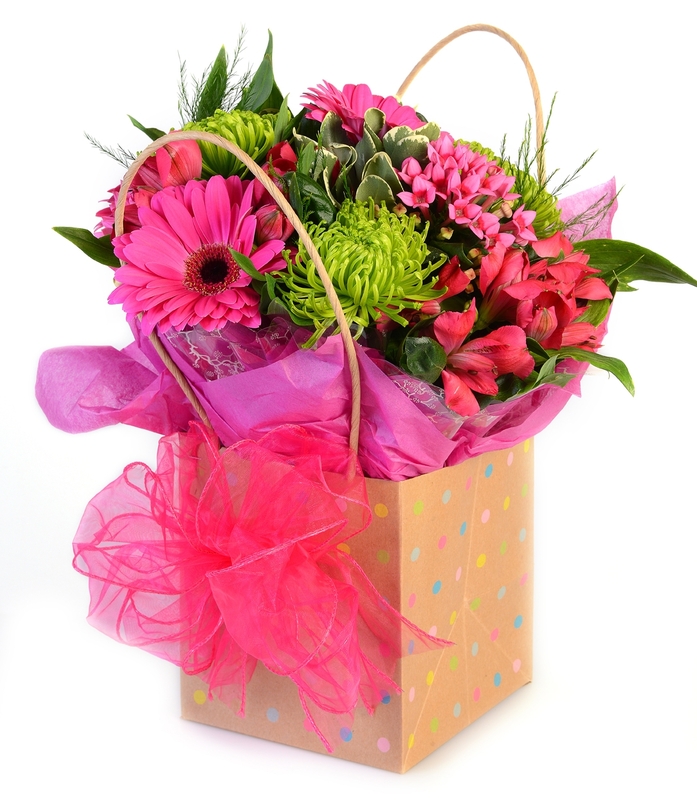 A bouquet containing a mix of flowers and foliage tied with ribbon and beautifully packaged in colour coordinating tissue and cellophane. The water is contained within the bag or box and just needs topping up every two to three days to maintain optimum freshness and beauty. Flowers - Cut 1 - 2 cm from each stem at a diagonal angle to maximise the surface area so the flower or foliage can take up the maximum amount of water. Add the flower food to the water. Remove all foliage that will be under the water level once arranged. Place in a cool area, out of direct sunlight and draughts, to maximise optimum beauty. Hand Tied Arrangements - As for flowers above, retain the tying point to maintain the design style. 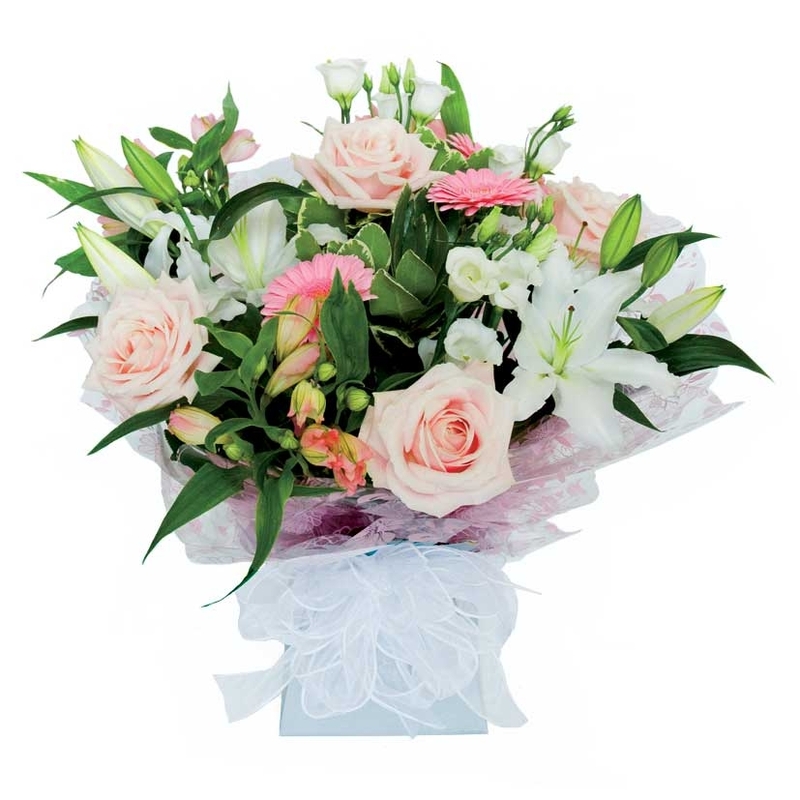 Hand Tied Aqua Arrangements - The design is created to be displayed in the box/bag and packaging supplied. All you need to do is check the water and top up the level every 2 -3 days. Place in a cool area, out of direct sunlight and draughts, to maximise optimum beauty. Flower arrangement in florist foam - Check the water daily and top up slowly as required, take care not to overfill. Place in a cool area, out of direct sunlight and draughts, to maximise optimum beauty. Caution - Some flowers and foliage may be toxic or cause skin irritation. Keep of out reach of children and pets. Always wash your hands after handling. Please ask our florists for help and advice. Lily stamens are known to stain permanently, please avoid contact with all surfaces, remove stamens if you prefer. Don't know where to start, other that you know you want to send flowers? Do they like a certain colour? Do they like a mood of colour - pastel; vintage; vibrant; contrasting .......? Where might they place the design - what's the decoration or colour scheme? What shape should the design be? Will it be seen from all angles or just front facing? Could a plant or planted arrangement be an alternative? Would you like to add additional gifts, e.g. balloon, teddy bear .......?